Char-Broil’s tabletop gas grill has been designed with portability in mind. It produces 11,000 BTU through a single burner, which is powered by a 16.4 ounce or 14.1 ounce propane cylinder. Foldaway, locking legs decrease the portable size of the grill, which is the perfect size for cooking up to ten hamburgers or hot dogs. The heat-resistant handles of this unit means that you don’t have to wait for it to cool down before you can move it to a different location. The grill-rack is chrome-plated to make cleaning easier and the whole unit is rust-resistant due to its high-temperature finish. Char-Broil’s tabletop gas grill feels robust and well-constructed. The legs fold easily and the unit is very compact. Its high-temperature black finish has an attractive glossy finish. However, some buyers have commented that the parts used in construction are pretty low-quality. In particular, the chrome-plated grill-rack about which, it has been said, is flimsy and difficult to clean. Other buyers mentioned that you should be careful when tightening any screws on the unit because they are easy to overtighten and strip. Overall, customers seem impressed with the quality and value that this portable grill represents, and were impressed at how easy it was to set up. As a portable grill, customers were impressed that they could store their propane tank and accessories inside the closed unit while carrying it to where they were going. Most customers have commented that the grill cooks evenly, even without using lava rocks, and that it is the perfect size for feeding anywhere from one to six people. They also thought that the temperature was easy to adjust and that the unit was easy to light. However, some customers did say that it was problematic for them to light the grill from underneath. The burner gets up to heat quickly, although it doesn’t seem to get hot enough to properly sear a steak or chicken breast, and has been reported as being inadequate for cooking chicken leg quarters all the way through. Many customers complained about burner failure, particularly during windy conditions, but some people used the lid as a wind shield and said that it worked perfectly. Another common complaint is that the regulator valve breaks easily, or doesn’t work right out of the box. Some customers have experienced problems attaching a propane cylinder to the regulator. Breakdown of the fiber washers situated between the plastic handles and the metal body of the grill also seems to have been an issue for people, with some customers reporting the handles beginning to melt when the two surfaces came into contact with one another. A final complaint seems to be a safety concern. 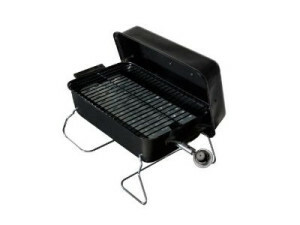 Although customers were generally pleased with the grill’s foldaway abilities, many people stated that the legs were wobbly and felt unsafe using the product. Coupled with the fact that the exterior of the grill gets as hot as the inside, most users seemed displeased with the safety aspect of this portable table top gas grill.